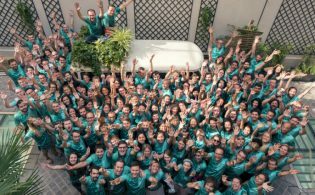 How does a travel company in business for 30 consecutive years celebrate its success? This was a no-brainer for Kurt and Anne Kutay, who founded Wildland Adventures in 1987. Of course, they would celebrate their loyal clients as well as those who long to travel with them. In recognition of their contribution, the company will offer a series of trip giveaways, the first being a trip for two to Thailand and Cambodia. The online contest begins July 13 and concludes at 11:59 p.m. August 3, 2017. Interested travelers may enter the Wildland Adventures Thailand & Cambodia Trip Giveaway by visiting the company website and completing and submitting the online entry form. Additional entries can be earned by referring friends or by visiting a number of social media sites such as Facebook, YouTube, and Instagram as explained on the contest page. 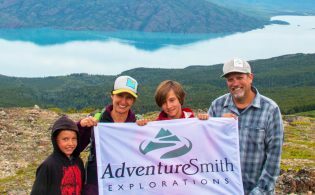 The Adventure Travel Trade Association (ATTA), of which Wildland Adventures is a charter member, is also helping promote this festivity through their consumer website. 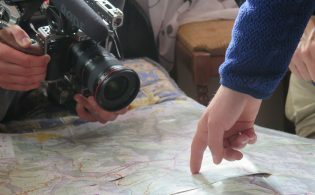 Adventure.Travel showcases the best adventure companies and stories inspiring travelers to explore the world in a passionate and responsible way. The Trip Giveaway winner and a guest will have time to build their excitement over the Thailand & Cambodia Trip where travel may be scheduled from August 30, 2017 to May 31, 2018. Upon arrival in Bangkok (flights not included), a Wildland Adventures guide will meet them at the airport and help settle them into the first of several boutique hotels they’ll enjoy en route. 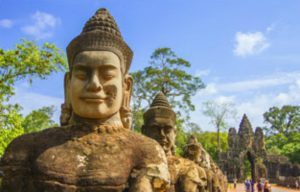 Although the pleasures of Thailand are far from exhausted, this tour next brings guests to the Thai-Cambodian border and on to Siem Reap’s Angkor Archeological Park, visually, architecturally and artistically breathtaking and one of the most important archaeological sites in Southeast Asia, if not in the world. Stretching over some 400 square kilometers, the park contains the magnificent remains (think Angkor Wat) of the different capitals of the Khmer Empire, from the 9th to the 15th century. 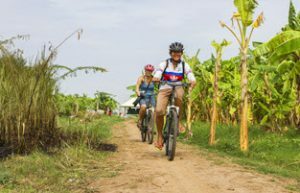 In the course of a bike ride along the Siem Reap River are children waving in small villages where cyclists see palm wine and sugar production, basket weaving and rice farming before transferring to the airport for the flight home. The Kutays three decades ago birthed a new travel concept they call The Wild Style. This means consciously choosing to travel deeper, not farther; to experience the world that craves our understanding and compassion rather than our judgement; to visit communities that seek to welcome us rather than entertain us.